If you work in the Transport sector and looking for a new role as a Transport Manager then you will previously have gained experience in this area and maybe you are coming from a Transport Coordinator or Supervisor role into a Manager role. Potential employers will be looking to see if you can manage a situation as well as a team of people and be responsible for the goings on in a Transport department. You will be required to have good working knowledge of transport, deliveries, routes, carriers or in house carriers etc and you must be able to organise this efficiently so that operations are not disrupted. You must be able to think on your feet and react quickly to situations as not all situations can be planned in the transport sector and you must be able to react well to this. 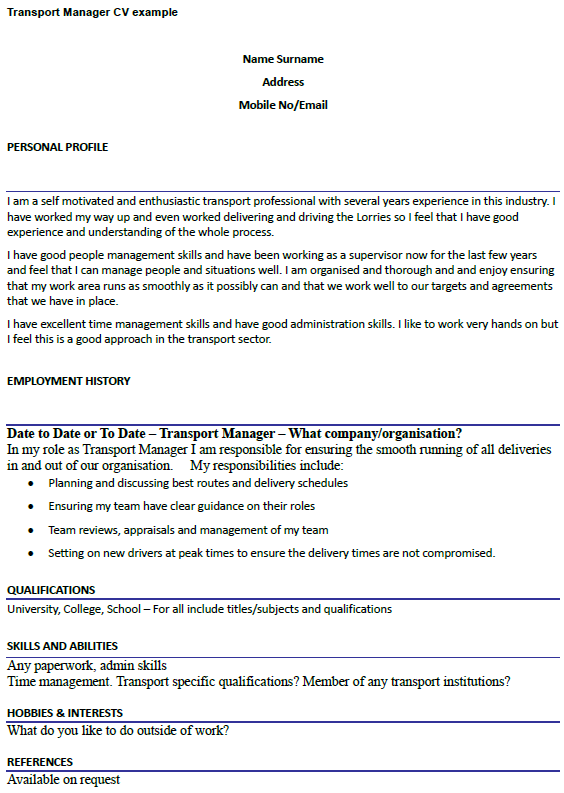 I am a self motivated and enthusiastic transport professional with several years experience in this industry. I have worked my way up and even worked delivering and driving the Lorries so I feel that I have good experience and understanding of the whole process. I have good people management skills and have been working as a supervisor now for the last few years and feel that I can manage people and situations well. I am organised and thorough and and enjoy ensuring that my work area runs as smoothly as it possibly can and that we work well to our targets and agreements that we have in place. I have excellent time management skills and have good administration skills. I like to work very hands on but I feel this is a good approach in the transport sector. Date to Date or To Date – Transport Manager – What company/organisation? Setting on new drivers at peak times to ensure the delivery times are not compromised. Time management. Transport specific qualifications? Member of any transport institutions?